In our current economy, there seems to be a renewed interest in trimming expenses any way possible. As somebody who has always viewed frugality as a virtue, I think this trend is great and hope to see it continue even after the economy rebounds. Being frugal means being wise and resourceful. It means being a good steward. It means taking pleasure in small things and being thankful. 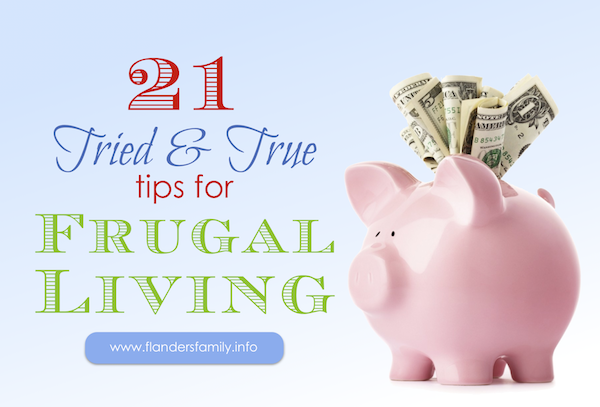 Frugality puts you in a position to help others in need. It frees you to be generous in areas that really matter. A penny saved is worth even more than a penny earned, because money you don’t spend is money you don’t have to earn or pay taxes on. Cutting back on expenditures may also allow you to cut back on work hours, freeing up time to persue some of the other money-saving projects on this list. So examine where your money goes and see if there are obvious areas that can be adjusted. One of the easiest ways to save money is to buy things second-hand. During the years my husband was in medical school, I spent every Saturday morning shopping garage sales, praying as I went for the specific things we needed or wanted. It was amazing to see how routinely God honored these prayers (He even provided the Waverly fabric I’d been drooling over at Hancock’s but couldn’t afford. It retailed for $20/yd, but I found two bolts of it at a yard sale and bought 40 yards for $10 total!). Garage sales in Tyler never seemed as plentiful as they were in Mesquite, so I did most of my second-hand shopping at Goodwill after we relocated, until a couple of friends began hosting a Children’s Clothing Consignment sale for a week each spring and fall. Now I can get just about everything I need for my kids’ wardrobes, except socks and underwear, by shopping the CCC sale just twice a year (every April and September). It’s also where I do the bulk of my shopping for family Christmas gifts and home decor. Sometimes what seems like a great deal is not such a bargain when you take into account hidden costs. For instance, I’ve passed up a lot of inexpensive but beautiful dresses because of three little words I see printed on the label: “Dry Clean Only.” Sometimes, I’ll buy anyway if I know it will be worn only on special occasions or suspect I might get by with hand washing, but if it is an outfit my daughter will want to wear twice a week and it will cost me $5 to dry clean it every time it gets dirty? Forget it! Another example of hidden costs that stack up fast? ATM fees. At first, my husband thought the two dollar fee charged by the ATM itself was well worth the convenience of getting cash whenever he needed it. Once he realized the credit card company was charging an additional $10 per transaction, and assessing three to four times as much interest on cash advances as on purchases, he was indignant and swore off using ATM’s forever, except in dire emergencies. Whether it is snaking a stopped up toilet, tightening a loose doorknob, cutting a child’s hair, or changing the oil filter on your car, it often pays to learn to do things yourself. Of course, some household repairs warrant professional attention — particularly any job that holds serious risk of injury, dismemberment or death, like repairing a gas leak, replacing shingles on a high-pitched roof, or cutting down a tree over two times my height. Nevertheless, for small jobs and minor repairs, a good how-to book can be worth its weight in gold. Home cooked meals are usually more healthful than what you can eat out, and roughly a third of the cost. And if you learn to be creative with the leftovers, you will multiply your savings. If and when you do decide to splurge, pick a time to do so when rates are low. 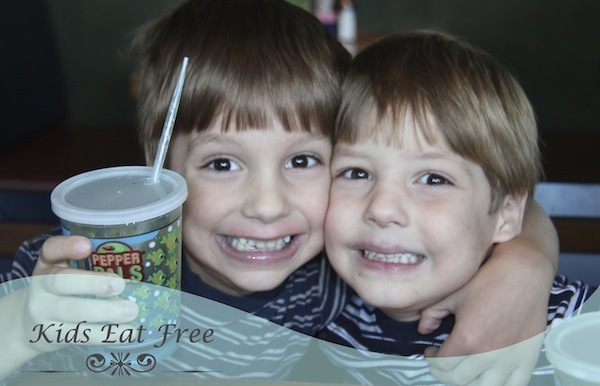 Eat out at places where kids eat free. Travel off season. Go on field trips with friends so you’ll qualify for group rates. You can often save a bundle by asking about student prices or school performances. Our family once got into Colonial Williamsburg for half price, just by flashing a membership card to our local home school support group. Instead of buying or renting books and videos, check them out from your local library. Many libraries also stock books-on-tape, periodicals, music albums, and even artwork that can be checked out for two to three weeks at a time. While you are there, inquire about children’s programs. The Tyler Public Library hosts weekly storytimes, summer movies, guest speakers, kids crafts, Lego workshops, American Girl parties, and reading clubs (with prizes!). I don’t know why more people don’t take advantage of such offerings, as they are a generally free and will help foster a lifetime love of learning in your little ones. Along these same lines, check out the benefits that come with membership to your local zoo or science museum. Your support not only helps improve the facilities in you own community, but will often pay for itself in just a couple of visits (especially if you have a lot of kids or do a fair amount of traveling, as many zoos and museums offer reciprocal benefits to similar institutions). By joining Discovery Science Place here in Tyler, we get free admission to a whole host of children’s museums and science centers nationwide. Likewise, a membership to Caldwell Zoo gains our entire family entrance into zoos in every other state. But zoos and youth museums aren’t the only clubs it pays to join. Many businesses offer free shopping cards which reward their customers points for every purchase. These can add up fast. I keep such membership cards in plastic business card sleeves in my notebook and pull them out as needed. Office Max, Office Depot, and Best Buy send quarterly gift certificates which can be redeemed with no minimum purchase required. Places like MacAllistar’s Deli, Einstein Bagels, and Time Square Cinema offer customer loyalty punch cards that can be redeemed for a free diner, a dozen bagels, or a movie ticket and small popcorn once the cards are full. And don’t forget those Airline Miles. Many restaurants, hotels, and car rental chains offer anywhere from one to fifteen miles per dollar spent, and these can really add up over time. Our family got ten free tickets to Europe by redeeming the miles we’d accrued through such programs. We’ve also gotten free season passes to Six Flags for our entire extended family through points earned on credit card purchases. One of our tickets to Europe was actually paid for entirely by cereal box tops we redeemed for miles, thus demonstrating the fact that it pays to clip coupons and to take advantage of refund offers. If you don’t have time to clip them yourself, do what my mother did and assign the job to a child. If you will let her keep a portion of the savings, she will be especially motivated to do a good job — I certainly was back when I was in grade school and my Mom struck the same bargain with me! The arrangement benefited both of us and turned me into a lifelong coupon clipper. The trick is to make sure you don’t buy things you don’t normally use, just because you have a coupon for it (unless, of course, a store doubles or triples that coupon so that you get the item for free). Of course, a lot of the shopping I do these days is online, which is why I am such a fan of Ebates. I shop all the stores I would normally shop and buy only the stuff I would normally buy, but by going through the Ebates portal to do it, I earn cash back on almost every purchase — usually 1-5%, but sometimes as much as 32% of my purchase price! The savings is well worth the few seconds it takes to click on Ebates before shopping. I even installed an Ebates button in my browser to alert my husband and children when cash back is available for purchases they make online. One click, and the savings are automatically credited to our account and added to our Big Fat Payment, which arrives once a quarter. When you find a great price on things you use regularly, stock up. If it’s perishable, buy only what you can finish off before it goes bad. If it’s not something that will expire, buy as much as seems reasonable based on the markdown. My husband shaved with an Atra razor back when we got married, and I remember being appalled the first time I saw how much the replacement blades cost. One day, I happened upon a stash of blades at Eckerd Drugs (now CVS Pharmacy) that had been reduced for clearance (from $6 down to 25¢ per package of ten!). Needless to say, I bought them all. That was twenty years ago. My husband used those blades for fourteen years before deciding to switch to a different brand of razor. I have been using our remaining stock every since and figure the supply should last until 2017 at my current rate of consumption. Some things warrant product loyalty, but others do not. I know better than to substitute a store brand for my husband’s Mitchum, no matter how great the savings, but there are plenty of items that nobody in our family can detect any great difference between generic and name brands. Especially with baking goods (sugar, flour, butter) and canned goods (tomatoes, beans, peaches), you might give the store brands a try and see if you don’t like them just as well. The savings is often substantial. This applies to more than groceries, too. I order generic ink for my printer at a fraction of the cost of name brand (about $4 a cartridge as opposed to $25) and find the print quality completely satisfactory for the kind of printing I normally do. Speaking of ink cartridges, did you know that Office Depot will give you $2 store credit for every cartridge you bring in to recycle (up to five cartridges or $10 credit per day)? But there are countless other ways to recycle: Reusing bubble wrap and shipping envelopes will save you a dollar a two per package whenever you need to mail bulky items. Empty egg cartons, tin cans, old magazines, cereal boxes, and foam vegetable trays will provide almost limitless possibilities for kids’ craft projects — all for free. You needn’t save/ recycle everything that passes through your possession, but don’t overlook your trash bin as a legitimate source of craft supplies. Composting is another way to reuse stuff you might otherwise throw away. Composting makes especially good sense for folks who like to garden, which is another great way to reduce grocery costs. Even if you haven’t much space, you can grow herbs on a sunny windowsill, raise tomatoes or strawberries in pots on your patio, or plant green onions as a border around your flowerbeds — all of which our family has done with delectable results. Gardening lends itself naturally to bartering. Have a bumper crop of cucumbers? See if a fellow gardner will trade you for his excess summer squash. Of course, bartering doesn’t have to be limited to exchanging produce. Would you be interested in swapping piano lessons for housecleaning? Math tutoring for lawn work? Babysitting for bread baking? Make a list of things you have or know how to do, another list of things you need or want to learn how to do, then send out feelers for frugal-minded friends who might be interested in exchanging goods or services. Carpooling is a common method of bartering. You drive your children and the kids next door to school or soccer practice; your neighbor picks them up afterwards. This saves time and gas.Circumstances don’t always allow for this sort of arrangement, but you can still conserve gas by grouping errands and running them all in one trip. Rather than taking two cars and going separate directions, my husband and I will often make a list of all the stops each of us need to make on a Saturday morning drive to town, plan a route that incorporates them all in an efficient manner, then drive together. We’ll bring a book or two along to read in the car during quick stops the other needs to make, then shop together at the stores that sell supplies we both need. This is really one of my favorite “dates” — we get to spend time together, and we get to mark a whole slew of stuff off both our “to do” lists. Many of life’s greatest pleasures can be had for free or almost free: a trip to the park to feed the ducks, a day at the beach, a hike through the woods, a round of charades in front of the fire, a backyard campout, a spirited game of tag, a cup of hot cocoa on a snowy night. Don’t be duped into believing that entertainment has to cost a lot of money. A trip to the movie theater would cost a family our size well over $100 once you throw in concessions, but for just a buck or two, we can pop all the corn we can eat at home and munch it while watching an old classic we checked out of the library for free. Whether you’re ordering a small coffee instead of a large, buying an economy instead of a luxury car, or moving from a big house to a more modest one, downsizing can help you save money. Bigger is not always better. It often means more calories and caffeine than we need (in the case of the coffee), higher gasoline and maintenance costs (in the case of vehicles), or higher mortgage and utility payments (in the case of home size). And don’t forget to factor in the time you’ll save by cleaning fewer rooms and tending smaller lawns. Another way to save money is to come up with creative new ways to do the things that need to be done. For example, many parents worry about how they’ll pay for their child’s college education, but with a little planning ahead, you can help your child earn a degree in a fraction of the time and at a fraction of the cost. Applying for all available grants and scholarships can lower the cost even further. This point may seem counterintuitive, but part of the reason we want to be good stewards of our money is so that we can help others and can support worthy causes with some of what we save. It is always a good idea to give back to God a portion of all He gives to us. The Bible teaches clearly that “He who is gracious to the poor lends to the Lord, and the Lord will repay him” (Prov. 19:17). You can never out-give God. Here are links to a few of our favorite charities, for those of you who may be interested in supporting them: Harvest of Hope, Compassion International, and Voice of the Martyrs. I have prayed for more selfish things than fabric but the Lord still felt fit to provide. All the things the Lord provides are sometimes just to make our heart smile! I am glad you got your fabric!! I love your story of faith, family, frugality, fun & love! How selfish to pray for Waverly fabric. I’m afraid I’ve prayed for much more selfish things than that, Patty, both in the past and now. I’m thankful God is so patient with me and continues to work in my heart, carefully aligning my desires with His, however slow that work may be. This must be an old posting cause Depot hasnt given money for ink cartridges in YEARS….now they give you that money as a credit to your loyalty card. you then get it on the monthly coupon they send you via email. still money, but money you MUST spend with them and you get a month after you recycle provided you meet other requirements. You’re right on both counts, Ryan. It is an older post — although it is getting so much traffic today, I plan to update it ASAP — and Office Depot does give credit instead of cash now, although we buy enough other office supplies there that it still feels like money in my pocket. Thanks for commenting. Hope you’ll visit us again soon. I make all of my own cleaning supplies and have not only saved tons of money, but I am also keeping potentially dangerous chemicals out of my home. This is enough to make at least 20 gallons of laundry soap(I make 5 gallons at a time). The borax and washing soda run out first, so the next 20 gallons will only cost $9. I buy my supplies at walmart because it’s convenient, but you can save even more money buying these items online, or you could probably even find them in bulk at Costco. 9. Enjoy clean and fresh smelling clothes! This recipe is even safe for HE machines! Great tips! Definitely motivated to be better stewards of our money after reading this.